I’m a big fan of Clif chocolate brownie bars. They’re only a dollar at Trader Joe’s, taste like a brownie, and unlike Luna Bars, don’t have rice crispies in them. I might have discovered the holy grail to making no-bake, gluten-free sweets that taste very similar to Clif bars – Medjool dates. By themselves, they are sweet, chewy, and have a rich caramelly flavor that makes me think of chocolate. However, I do find them a tad bit dense, and they are fairly caloric (about 60-70 calories per date; for context, an average apple is about 90 calories). 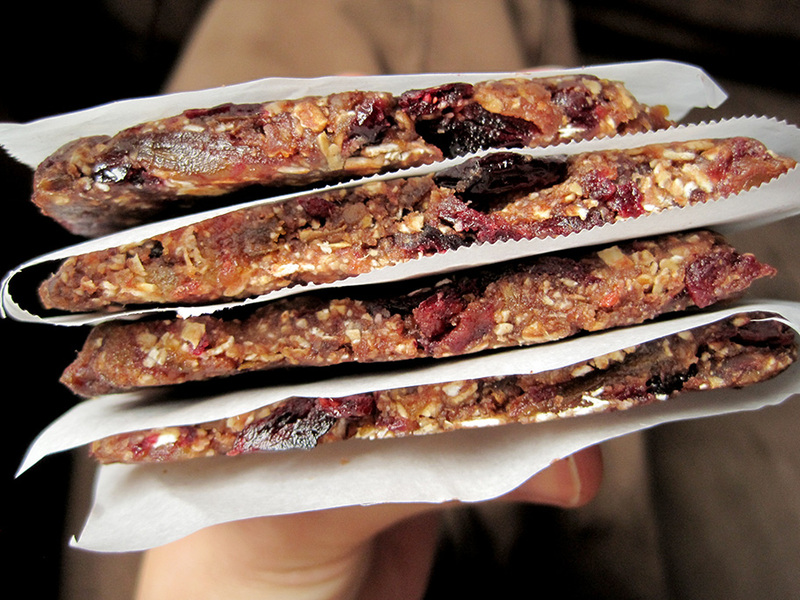 However, their sticky nature means they act as an effective binder when blended in with oats and other nuts. 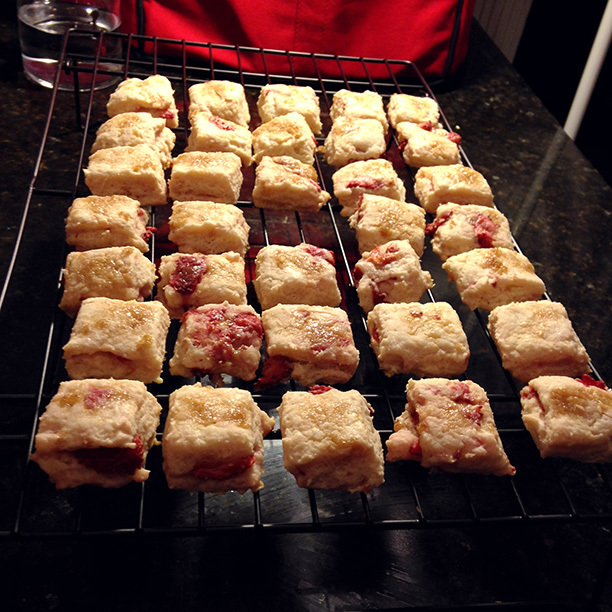 I browsed around for some recipes, and it is really great how flexible this recipe is. 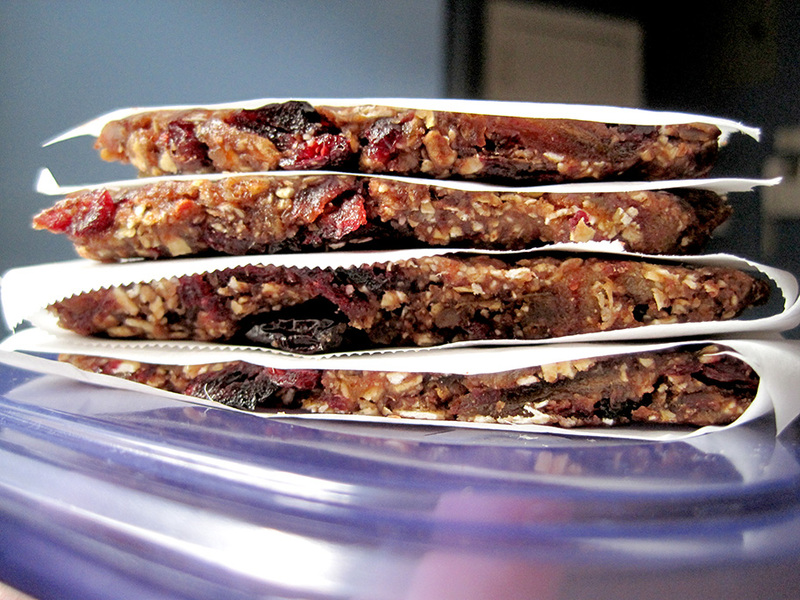 Some combination of dates and oats along with almond flour and other berries would work well. I think this would be a pretty good hiking mix since it’s so compact and easy to eat, but note that there isn’t a ton of protein in it compared to the Clif bars. I made my version with cranberries and cocoa powder, but I imagine you can switch up the flavors as you like, using dates (to bind) and almond flour (for protein) as a base. I imagine raisins, chocolate chips, white chocolate chips, maple syrup, and honey would work well here too. I also used a Vitamix to blend the ingredients since I don’t have a food processor, but that seemed to work out fine. Put everything in a food processor and blend till it is reasonably mixed up. You still want some chunks, so no need to puree it up. Mold it with your hands into balls or bars, and either eat right away if you’re hungry, or refrigerate so it hardens up. These cookies were inspired by a mom’s homemade oatmeal chocolate chip cookies that she had sent to her (adult) children. 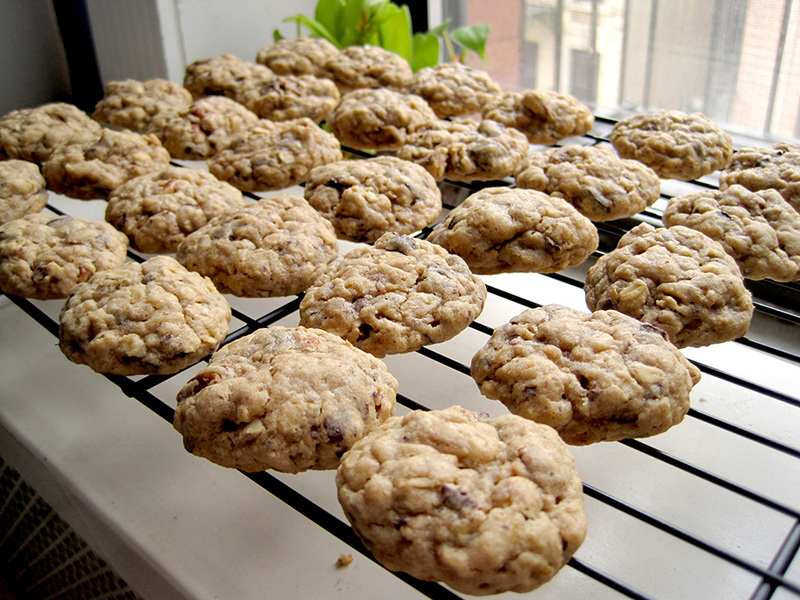 When I was vacationing in California and visiting a friend, he opened up a package he had just received from his mom and inside was a big tupperware of oatmeal chocolate chip cookies. Having felt deprived of honest-to-goodness homemade food for a while, those cookies were manna for my hungry soul. Oatmeal cookies tend to get a bit of a bad rap because of those darn raisins that fool you into thinking that they are chocolate, but those cookies were all oatmeal chew with the deliciousness of chocolate and none of that raisin deception. I did a bit of research on the Internet for a recipe that would replicate those cookies’ chewy yet light texture, and I struck gold with this one. Just look at the alluring crackly tops in these cookies! I’m typically all for a chewy cookie, but chewy cookies tend to be a little denser, and I wanted something that had some levity to it. This Cooking Light recipe seemed like it might be a good fit, and the 1/3 cup of butter confirmed my intuitions. 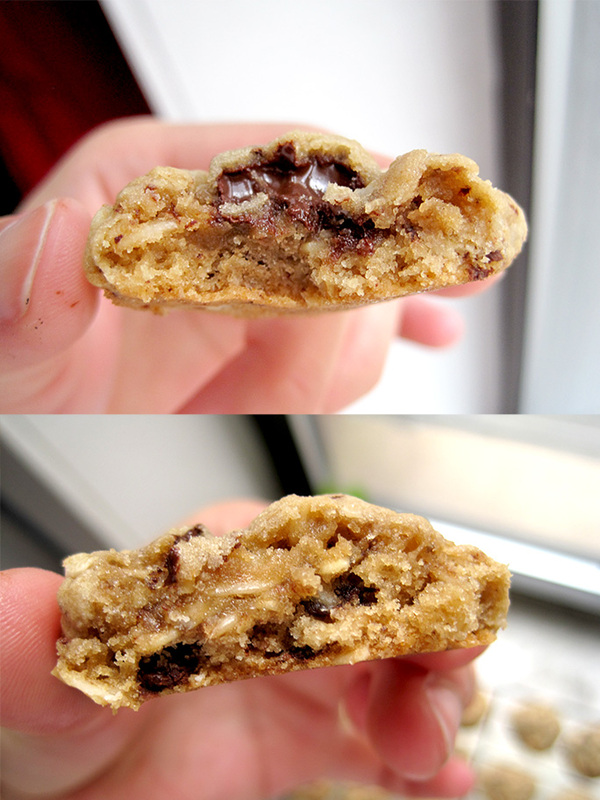 The cookie itself has a crisp exterior, and a chewy interior due to underbaking it just a touch. Baking soda and baking powder lent volume to the cookie, while oatmeal added bulk and texture without the density of flour. Pecan pieces added just a right touch of crunch. Instead of using chocolate chips, I used semisweet Trader Joe’s Pound Plus chocolate, chopped it up into small, almost flaky pieces, which adds subtle chocolate flavoring here and there, with an occasional melty chunk. I used 1/2 cup less sugar than the recipe recommended and it was still sweet enough. Since these cookies are meant to be light, use a weighing scale to measure out your ingredients as far as possible. In the vein of Louis CK, you don’t stop eating these cookies when you’re full – you stop eating when you realize you have just eaten 7 of these at a go and nothing else for the day. Place sugars and butter in a large bowl; beat with a mixer at medium speed until well blended. Add vanilla and egg; beat until blended. Gradually add flour mixture, beating at low speed just until combined. Stir in pecans and chocolate. Drop dough by tablespoonfuls 2 inches apart onto baking sheets lined with parchment paper. 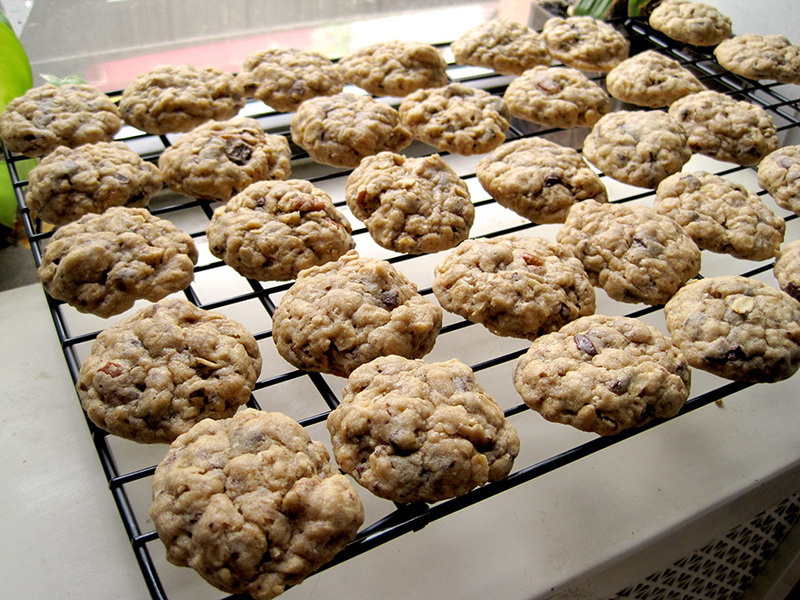 Bake at 350° for 12 minutes or until edges of cookies are lightly browned. Cool on pans 2 minutes. Remove cookies from pans; cool on wire racks. Scones are a very summery sort of baked good to me. I think it might be the fact that it often incorporates summer berries such as raspberries and strawberries, and also its quick bake time – nobody wants to leave the oven on all day and toil away in a hot kitchen, especially in the summer, do they? The petite sizes also don’t weigh you down, leaving you free to pop a couple in your mouth and then get going with basking in the summer sun. The nice thing about this recipe is how simple the ingredients come together. There’s no complicated butter-browning or whisking-to-stiff peaks; it’s pretty much a one-bowl recipe that involves stirring. Because the ingredients are so minimal, I recommend getting quality, sweet strawberries as it would really improve the outcome of these scones. I used frozen strawberries that I defrosted, but they weren’t very sweet. I also didn’t have turbinado sugar, so I used dark brown sugar mixed with granulated sugar for topping, but I suspect turbinado sugar would have added a more delightful crunchy texture. Since scones tend to do best straight out of the oven, definitely freeze the dough if you have excess and bake them when you need them, instead of all at once. Place a rack in the upper third of the oven and preheat oven to 425 degrees F. Line a baking sheet with a Silpat or parchment paper and set aside. In a large bowl, sift flour into bowl. Whisk in baking powder, salt, and sugar. Slowly stir in 1 1/3 cups of cream and vanilla extract. Add the strawberry chunks. Toss together. Add a tablespoon or two of cream if the flour doesn’t come together – but you want it just be cohesive, not wet and sticky. Dump the dough onto a lightly floured work surface. 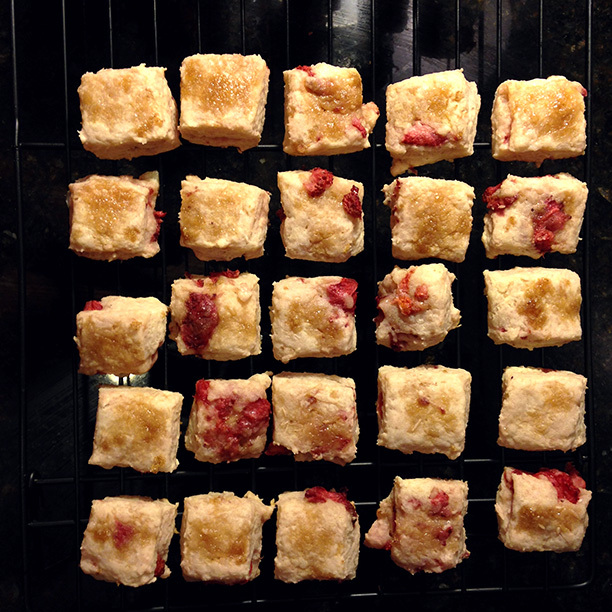 Knead into a 3/4 inch thick sheet and cut into one-inch sized squares with a sharp knife. Brush each circle with heavy cream and generously sprinkle with turbinado sugar. Place 1-inch apart on the prepared baking sheet and bake for 12 to 14 minutes or until golden brown and cooked through.